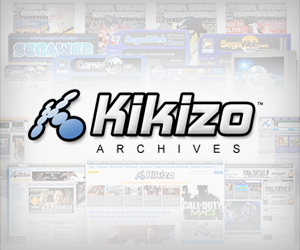 Kikizo | News: GTA San Andreas: Screen Starve Ends! 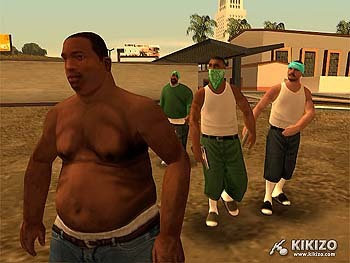 GTA San Andreas: Screen Starve Ends! It's no secret that your favourite game sites have been starved of GTA new screens since May - so these should go down a treat. There can be little doubt that Rockstar is being pretty smart about handling the media for Grand Theft Auto: San Andreas. It's easy to sit back and say, "ah, everyone's gonna buy it anyway!" - but would you be as hyped about the game if not for the excitement each time another screen-loaded exclusive feature appears? The websites have had to make do with just four screenshots since May but now, in order to demonstrate a key feature of the game Rockstar wants the savviest audience to know about (you - the online posse), they've fed us these "appetisers". 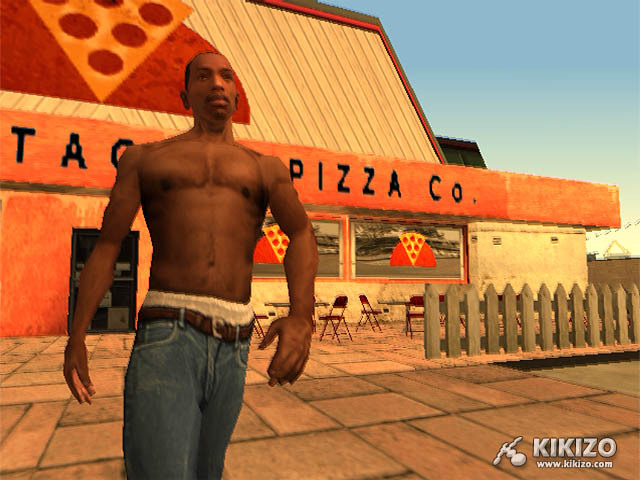 New San Andreas screens? Surely not? Tasty! Oh man, these hit the spot. Click for big versions. 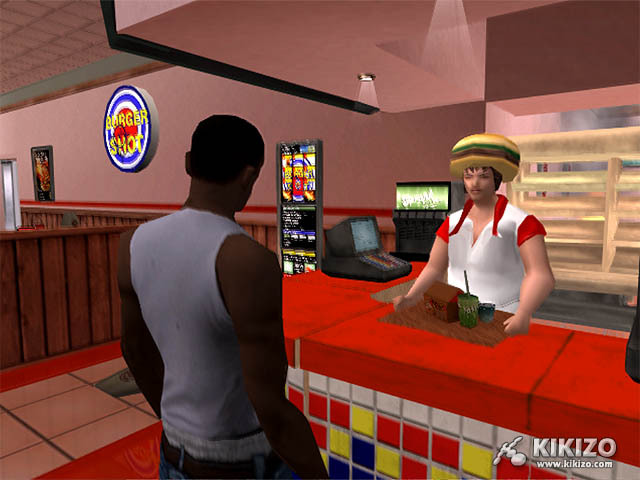 As you'll know from reading any article about the game, including our original preview, the main character, CJ, needs to eat. But what does this mean, and how does it work? It sounds initially like a relatively simple idea, but when you start to think about all the possible ramifications of what this actually means, it's clearly a major part of the game. When CJ is hungry a help message will appear, if he doesn't eat soon his energy level will start to decrease. If CJ forgets to eat he will lose energy and start to get skinny, and will eventually become rather emaciated and weak. His clothes will fit him differently as he gets thinner. But its not all about looks, as CJ gets thinner from under-eating he becomes weaker, he wont have the strength he needs to lift boxes, his speed and stamina will be greatly reduced as he swims, cycles and runs. As he gets weaker the force of his punch will dwindle and he wont last long in a fight! So, to stay in shape and keep his strength up CJ will need to eat regularly. Eating a good solid meal will also restore CJ's health. Each type of food has a calorific value which is used to determine how much the energy/fat will increase. So, after a fight you may want to head over to the nearest hotdog stand to help you feel better. But anyone who thinks that just hanging out eating pizza all day will make you indestructible - you should know better. Binging is bad. If you try and stuff CJ full and eat too much he will throw up! Needless to say any of the benefits of the nutrition you consumed are lost and your stamina is reduced to what it was before you pigged out. And you wont get your money back! Furthermore, once you've regurgitated your food, you wont be able to buy anymore for a while. As CJ eats he gains weight. If he keeps eating, and eating, he will gain more and more weight and as he gets fatter he starts to bulge out of his clothes, he begins to waddle rather than walk, even standing still he struggles to catch his breath when overweight, every animation is affected - he cant even put his arms by his sides in the same way. Naturally, carrying all this extra weight around will impact on his performance, he will have trouble with anything that involves exerting his body - lifting, climbing, swimming, running etc. His reaction time will also be a lot slower so you'll want to avoid fights wherever you can, especially since a bigger body is a wider target! His larger frame becomes a hindrance to his stamina and ability to perform many actions. Some things will actually be impossible for him to do when he is too heavy! Some people generally are cruel and not very understanding of those of us who are rather rotund! The inhabitants of San Andreas are seemingly no more forgiving on this issue. 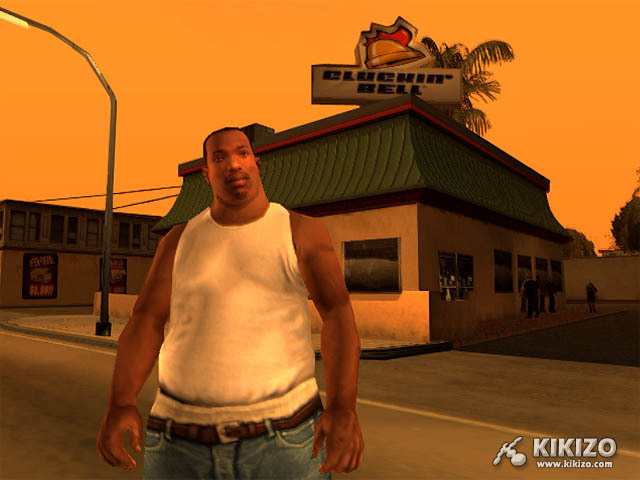 As an overweight CJ walks down the street the reactions he gets will be very different to when he is in peak physical condition - especially from the women! Shaping up: If you want to get in shape you'll need to spend some time at the gym, working out. But there's more to being healthy than just being thin, you'll want to pay some attention to building some muscle strength. A healthy CJ will be faster, stronger, have more stamina and a quicker recovery time. But it isn't just a case of CJ being fat or thin, there are two statistics at work here: fat and muscle, so for example CJ can be relatively thin and have little stamina, but have exercised and built up his strength to the point that he hits like a tank. We will be covering more about exercising in a later feature but for now suffice to say that the system is incredibly subtle and there are a ridiculous number of fat/muscle combinations that not only affect the way that CJ looks, but his actions and performance and the way that other people react to him. 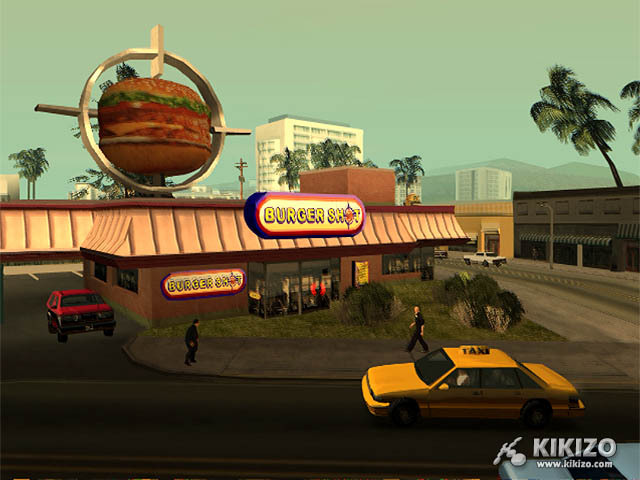 Places to Eat: Whatever food you're craving, San Andreas has is all, especially if it's fast food. 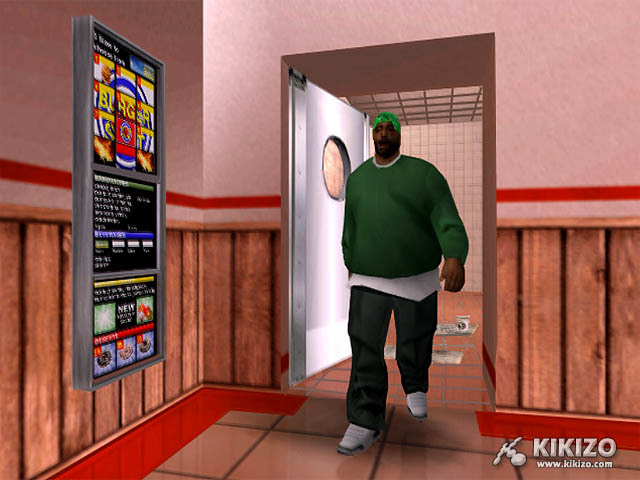 Rockstar explains: "One of the things that stood out to us when researching Grand Theft Auto: San Andreas was the enormous impact food and restaurants had and still has on Los Angeles. Just the variety of restaurants and how they've come to embody the lore of LA, from the Brown Derby to In-and-Out Burger, is truly astounding and bizarre all at once. We kept encountering stories of people that went in for a burger and came out wanted for double homicide!" 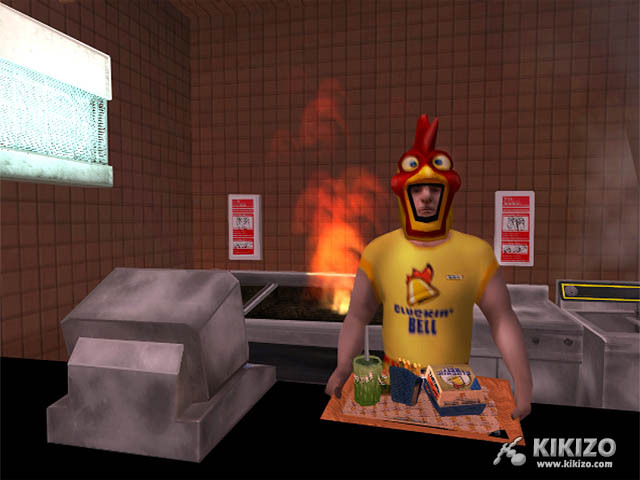 This chicken shack features all things chicken-chicken burritos, fried chicken, wings-all served by guys in chicken suits. Menu choices include the Cluckin' Big Filet Burger and Cluckin' Huge Double Filet; the wings pieces bucket and fowl wrap burrito. Pizzas and more. The Buster, The D-Luxe, and The Double D-luxe are enough to tide even the hungriest of players over, but be careful about how much you gorge-the staff here is a bit aggressive and won't take lightly to you vomiting all over the counter. If you like ground beef, this is your spot. Lots and lots of beef. The Double Barreled Burger is always a favorite. While you're there, you'll want to have a look around you at the décor in these places - you'll also notice other customers ordering and eating food - everyone's gotta eat! If you want to eat on the go, you don't have to go to a restaurant to grab a bite. Stop by one of the appealing vending carts and pick up a snack. Food Sim? No, cuz. One final thing that is important to note is that this is not a game about eating! Eating is a fun component that is a part of increasing the player's control and interactivity with and customization of their individual character. Stay tuned for a whole lot more on San Andreas, as the game's October release gets closer. Click here for our original big preview.